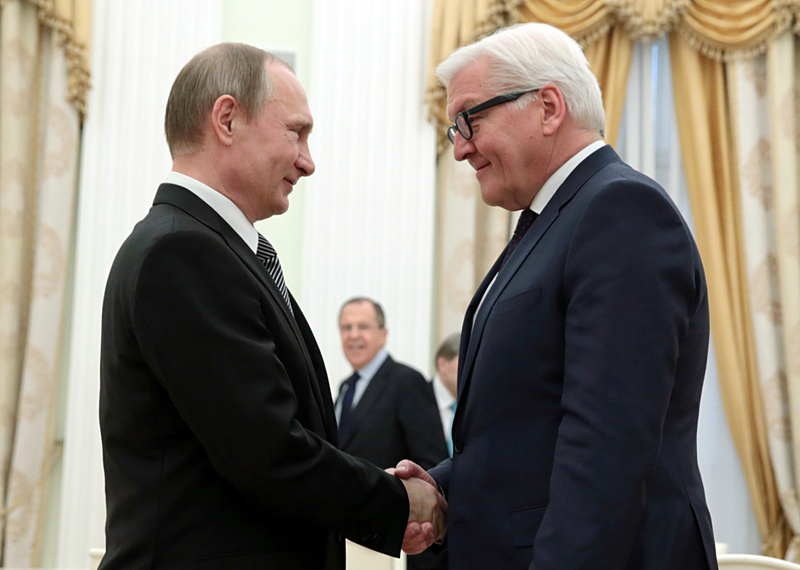 Russian President Vladimir Putin and German Foreign Minister Frank-Walter Steinmeier. Russian President Vladimir Putin said that the recent terrorist attacks in Brussels would be high on the agenda at his meeting with German Foreign Minister Frank-Walter Steinmeier on March 23. "Our meeting is being held against the backdrop of horrible, tragic events in Belgium and, certainly, we will have to pay proper attention to this at our talks today," said Putin before the meeting with the German foreign minister. For his part, Steinmeier said that "this is Belgium, which demonstrates the circumstance that we live in a world full of conflicts and tension, primarily in the Middle Eastern region." He added that the events in Brussels "demonstrate the need to unite efforts" in fighting terrorism. He also said he wants to discuss the situation in Syria and Ukraine. Meanwhile, Putin and Steinmeier noted that there are certain moments in the bilateral relations that give a reason to be optimistic. "I would like to point out that despite all the difficulties that we come across, the work through the foreign ministries of Russia and Germany goes on in a rather dynamic way," Putin said. Steinmeier said, for his part, that he is satisfied with the current condition of the Russia-Germany relations. "I am delighted that, where it comes to the bilateral relations, there are some points and trends to actually bring about a reason to be optimistic," Steinmeier said.